Today is a special day here, and not only because I’m celebrating Thanksgiving with family (though they are at the top of my list!). 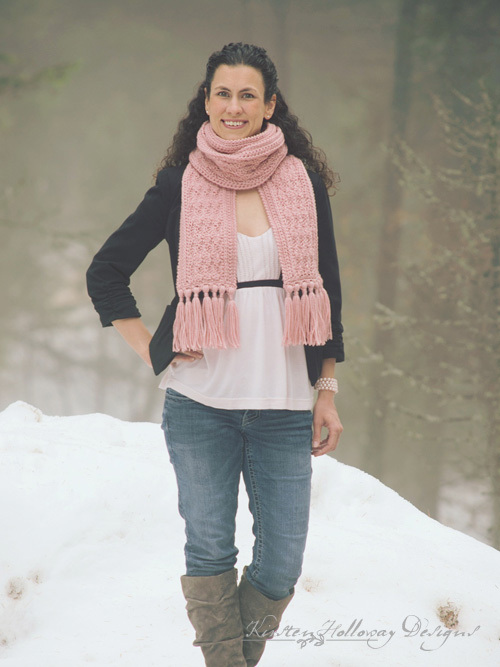 I’ll tell you why in a moment, but first I’ve got to gush over this new cozy scarf pattern! It’s simple and easy to crochet, the texture is subtle, but gorgeous, and the special touches (crab stitched edging, and tassels) really bring this piece to the next level! 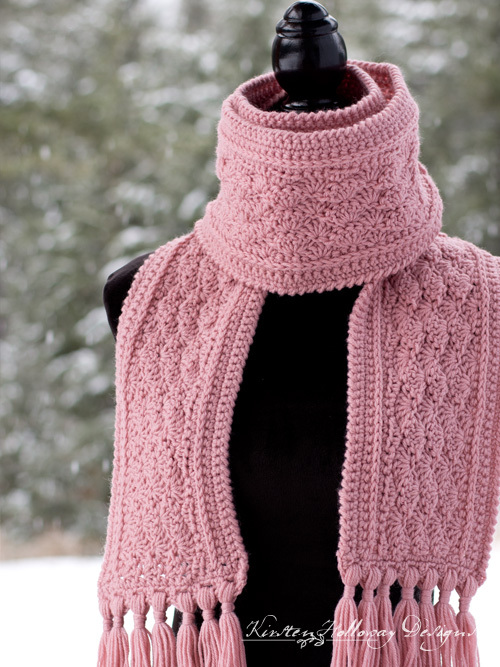 Anyone from beginner to experienced crocheter will be able to make this beautiful ladies scarf, and if rose is not your thing, it will look just as fetching in neutrals as it will in bright, eye-catching colors. I’ve also included the multiple count so you can adjust this pattern to be shorter or longer based on your needs. There’s even a spot that tells you how to make this into a wrap (because if you’ve figured out anything about me in the last year, hopefully its that I love beauty, options, and inspiring you to greater creative expression)! Ok, so why is today so special? It’s because a year ago today, I released the ski hat pattern that launched me into being a designer! *throws confetti* You can find the matching La Vie en Rose earflap hat and the story behind it, over here. It was a happy coincidence, and I feel so blessed to have been able to provide you with beautiful crochet patterns throughout the last year. Your sweet comments and stories have touched and inspired me, and I thank you from the bottom of my heart. Alright, enough of the mushy stuff, let’s get started! -Crab Stitch (also known as the reverse single crochet). This stitch is formed as you would make a normal single crochet, but at the end, you go backward, working your next crab stitch into the previous stitch, and not the “next stitch” (ahead). If you get stuck, check out this helpful video from Moogly. -hdc in the 3rd loop: Look at the top of the stitch, and locate the sideways “V”, bend the stitch to look at the back, and you should see another “V”. You’ll be working into the back loop of that “V”, this is called the 3rd loop. When you are working in rows, this 3rd loop may be facing you after you turn! -The crab stitch edging is optional, but will give the scarf a more finished, professional look. -Some people may find their edge is more even when they go down a hook size or two for this step. -Not a fan of doing the crab stitch? 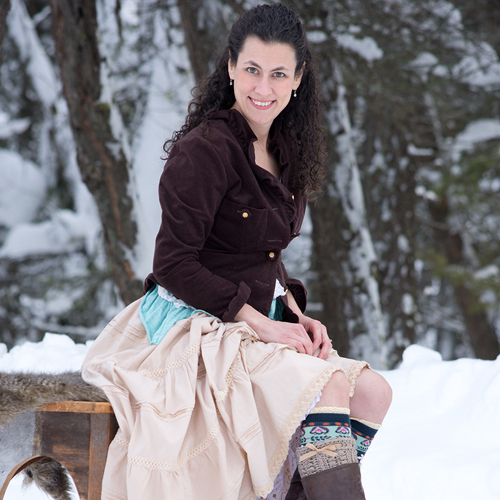 You may do a row of sc on the top and bottom edge of the scarf instead, if you wish. Repeat rows 6 and 7 two more times. Note: If you want to turn this into a wrap, repeat rows 6 and 7 until your piece is as wide as you’d like, then continue with the rest. Loop nine 12” pieces of fringe through each hole on the ends. Wrap a piece of yarn around the fringe several times to create a tassel. Tie off securely. Repeat this section at the other end of the scarf. Note: If you do not wish to put the crab stitch edging on, you may do a single crochet edge instead. Love the look of this scarf. Want to try it soon. Thank you, Pat! Have fun making it! I absolutely,utely love that scarf! 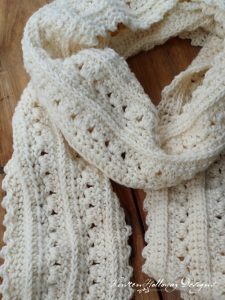 Although I’m a new crocheter, I would love to try to make this scarf! So beautiful!! Love the color!! This is beautiful and I can’t wait to try it. I do have a question about the stitch count if I want to make it shorter. I don’t see how the chain and first row fit the 6+1 count. Should I start with your chain and just subtract multiples of 6 to estimate the length I want? Thank you so much for sharing this. I am making scarves for a local school program and I’m sure this will be a hit. The way I came up with a multiple of 6 +1 is 252 (divisible by 6 is 42) plus 1 is 253, plus add one more for the turning chain makes a beginning chain of 254. Does that make more sense? I think it’s wonderful that you plan to make these to benefit your local community! Thank you, Donna! I’m thrilled you’re enjoying the patterns so much! This pattern is beautiful. I can’t wait to make it. I had a little trouble printing the pattern however. Pg. 5 ended with row 5 of the pattern. Pg. 6 started with rows 15-16. No rows 6-14!? Then Pg.6 ended with Scarf ends: Attach yarn to one end of scarf. Pg. 7 started with Fasten off & weave in ends. No rows 1-3.!? Has anyone else had a problem like this? or maybe it’s just my printer-it must have dyslexia or some other odd-ball problem! Sounds like it could be an issue with your printer. Better luck on the next try! Just found this pattern today, I am so excited as I just started to crochet and was looking for my first project. BINGO, I have found it. Awesome! Good luck on it!